The last few months have been a whirlwind of developments for the Strive Centre Vancouver. Thanks to MEC and Feel Films, their shelves are stocked with shoes and backpacks for the monthly Nature Walk program. They reached out to MEC and Feel Films and both companies generously donated an ample supply of backpacks and shoes for participants to use. Each participant now has their own pack, which includes bottled water, a rain poncho, and a healthy homemade snack made by participants in the Healthy Baking program. An anonymous philanthropist donated $5,000 towards the Centre’s growing music program. Registered Music Therapist, Carolyn Neople provides an inclusive and progressive music therapy session. It begins with a 15 minute warm up activity that engages participants in vocals, percussion, guitar, ukulele, electric piano, and drums. This is followed by 45 minutes of group singing or instrumental practice. This program invites all abilities and levels to explore the therapeutic value of music. Increased memory, cognitive benefits, and stress reduction are all associated with music therapy. 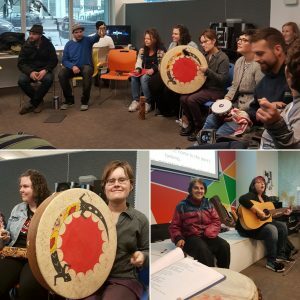 This program increases community connection through musical exploration with others. Antisocial Skateboard shop donated skateboards that will be put to excellent use by the Centre’s Outreach program. Finally, the Centre received the excellent news that Music Heals Canada has selected Strive as the recipient for a $3,300 grant. This will be allocated towards continuing to grow the music program. Sincere thanks to MEC, Feel Films, the anonymous donor, and Music Heals Canada for their support and generosity!